Bonny Eagle was prepared as ever to play the Red Riots of South Portland. South Portland has been somewhat of a thorn in the Scots side of late, but not this night. While Bonny Eagle's Spread Offense gets all the press, the Bonny Eagle Defense is what turns most heads. 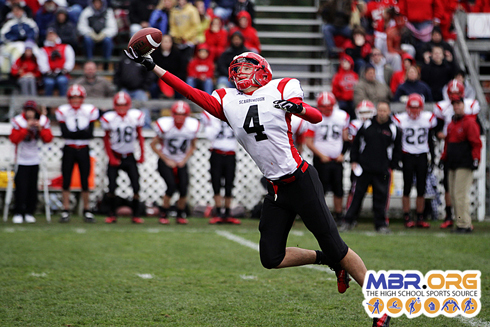 South Portland entered the Bonny Eagle Red Zone 4 times, and each time came away with zero points. 3 turn over on downs and 1 fumble was all the Red Riots could muster when in scoring range. Bonny Eagle got a 30 yrd TD play from Cam Cooper and RB's Ethan Thorne and Nick Adkins got TD runs of 30 plus yards to put South Portland away. I asked Coack Kevin Cooper about his defense and it's lack of recognition from the media. Thornton Academy kept it close for most of the 1st half, even tying the game at 14 - 14 with a little over 5 minutes left. At that point, everything fell apart for TA. The Golden Trojans fumbled 3 times in the final 5 minutes and Deering capitalized on, makeing a 14 - 14 game, 28 - 14 before the half. A scary moment, as TA WR James Ek was carted off after landing hard on a leaping attempt. Ek was transported to the hospital, but was released and is OK.
Deering finished off TA 56 - 18. Scarborough had never played a Class A playoff game, sure didn't look like it Saturday at Waterhouse field in Biddeford. Scarborough put Biddeford on their heels right from the start as Dennis Liu returned the opening kickoff 90 yards, and they never looked back. 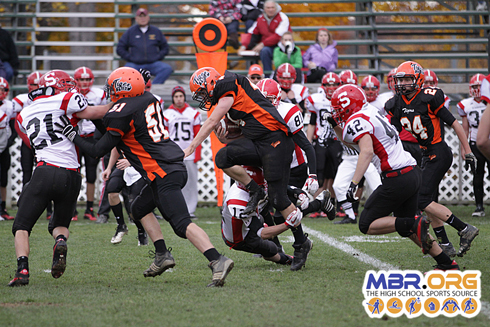 Biddeford looked out of sync all day, losing key players to suspensions for violations of team rules. Scarborough got great play from QB Jack Adams and RB's Scott Thibeault (two touchdowns) and Mark Pearson. Check Out Photo Galleries HERE at MBR.ORG Exposure Manager!